Note: If any of the listed contents are damaged or missing, please feel free to contact us, we must solve this problem immediately. ★ Awesome speed: Maximum speed up to 5GHz 433Mbps or 2.4GHz 150Mbps. Ideal for gaming online and seamless HD video streaming. Ultra-fast AC600 wireless adapter speed with 802.11ac. ★ Awesome 2dBi external antenna design: High Gain Long-Range 2dBi Antenna can help you connect even when signals are weak. Much more stable signal, no more drops, moves in full rotation, easy to set it where you need to pick up the best signal. ★ Awesome compatibility: No drivers required for Windows 10! Just plug and play! 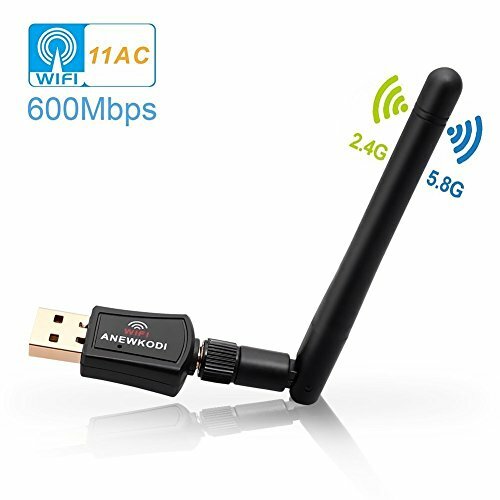 Compatible with windows 10/8/7/Vista/XP/2000, Mac OS 10.4-10.12.4..
★ Awesome quality : 802.11AC - the newest wifi technology, High-end technology to ensure the quality of the products, increase of service life. Works with Any WiFi Routers. If you have any questions about this product by ANEWKODI, contact us by completing and submitting the form below. If you are looking for a specif part number, please include it with your message.